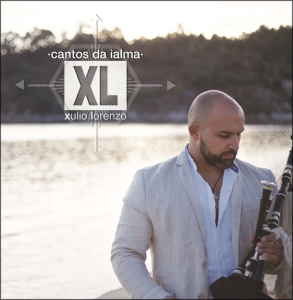 Welcome to the official page of Xulio Lorenzo. Here you will find all the news from their first album “Cantos da Ialma” which will be released at the beginning of 2017. It was on Christmas day in 2015 when the idea of capturing all those melodies the musician from Mos had composed since his return to the stage in 2011. That work, as our interpreter dreamed of, needed the best allies so that all the hidden magic in his melodies as forgotten tales sleeping in an old trunk, could come out of its lethargy with all strength and with its maximum splendor. Without thinking Xulio Lorenzo sought the pillars for its Tower of Breogan, firm and solid pillars placed with the greatest of illusions and moved by the musical passion of the artist… The wisdom of master Paco Dicenta, MUSICIAN with CAPITAL LETTERS and Director Musical of the project, the brilliance of Diego Bea with his guitar, the delicate sound of Ioana Pérez with of the violin, the talent of Roberto Comesaña with the accordion, the magic of being in charge of the time in the hands of David Outumuro, the voice of Noélia Álvarez and the feeling in the piano of Alberto Vilas. All of them form the perfect “Tándem” to express the meaning of the “CANTOS DA IALMA” with his music.